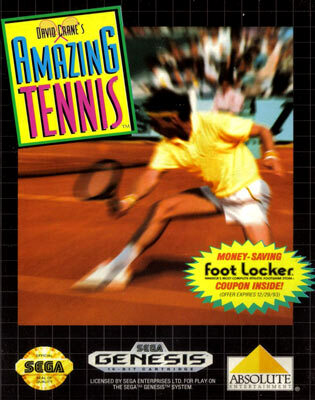 David Crane’s Amazing Tennis places you on the court using a low perspective never seen before in a Sega Genesis tennis game. Select a computer opponent or grab a friend and get ready to compete on hard, grass or clay court surfaces. Fifteen computer players are waiting to be challenged in either a Tournament or Head-to-Head game, so type in your name and choose between a left or right-handed athlete. Then it’s off to the court. Players can use topspin, execute drop shots, perform volleys, lobs, slices and overhead smashes, and decide on either a hard or soft serve to keep the opponent off balance. World-famous chair umpire Frank Hammond will call the score and instant replay lets you see if he was right!